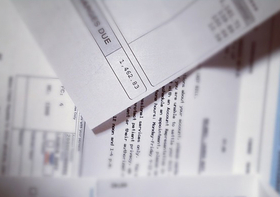 Over the past couple years, it's become clear that even if you have health insurance in the U.S., you're still susceptible to receive pricey medical bills—many of which can be a complete surprise. The stories have been everywhere. Elisabeth Rosenthal's series in the New York Times spotlighted many of them, such as an insured patient who was saddled with a $117,000 hospital bill from an unknown, out-of-network assistant surgeon. Surprise bills have even popped up in less obvious places, like urgent-care clinics. What has frustrated patients is that these charges roll in even though they did research and, presumably, went to an in-network hospital or saw in-network physicians. The federal government wants these stories to end. Embedded within President Barack Obama's 2017 budget for HHS (PDF) is a provision to “eliminate surprise out-of-network healthcare charges for privately insured patients.” Details are scant, but the administration would try to solve the problem by requiring physicians who “regularly provide services in hospitals” to accept in-network rates, even if they aren't in the insurer's network. Hospitals would also have to “take reasonable steps” to ensure patients see in-network physicians. Patients face unexpected charges usually because of large payment disagreements between insurance companies and physicians. Physicians refuse to participate in an insurer's network, arguing insurers are low-balling them, but insurers say doctors ask for unreasonably high rates. Hospitals, and patients, are often left in the middle. Under Obama's budget, patients would be removed from the disputes, and physicians would have to cave to the insurers' rates. That differs from New York, which recently passed a law that set up an arbitration process for insurers and providers to work out their differences while holding the patients harmless. Other states such as Pennsylvania also are looking into ways to solve the issue. Obama's budget for 2017 stands pretty much no chance of moving through Congress, but it does reveal the president's final priorities for his own and future administrations. It's unclear how HHS could turn this proposal into a reality. One health policy expert has a theory, but she cautions it's difficult to draw conclusions without more details.